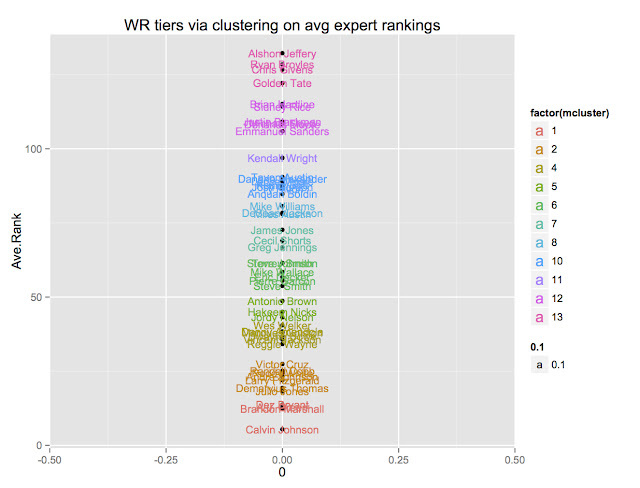 As promised, here is my analysis for PPR leagues. To summarize my model, I take the average ranking from all 37 experts with updated rankings from fantasypros' PPR list, plot them in one dimensional space, and using a gaussian mixture model clustering algorithm to determine natural tiers of players. The result is well defined tiers and beautiful visualizations. 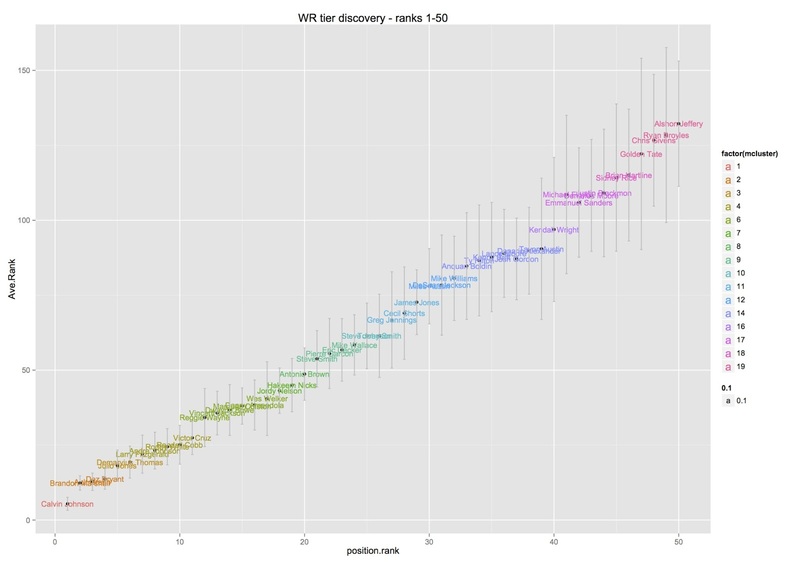 This analysis is for 1 point PPR leagues. I've had requests for 0.5 point PPR as well, but unfortunately, there's no data available for that. If you are so inclined, just average these results with my other ones for a good approxmation. This is becoming a popular request, so I'll play with the data and see if I can come up with anything post worthy. Quarterbacks remained unchanged, so for QB's, I refer you to my previous post. In a 12 player league, at least two teams will get left out with their RB2 outside this tier. At least four teams will get left out in a 14 player league. However, in a 10 player league, unless a few people get trigger happy with RB's, there are enough for everyone's RB1 and RB2. Based on this, I'm not convinced the "go ham on RB's" advice is as urgent for smaller leagues, as you can still get two RB's better than Wilson. Here we illustrate the variance of each players rank with the grey bars. 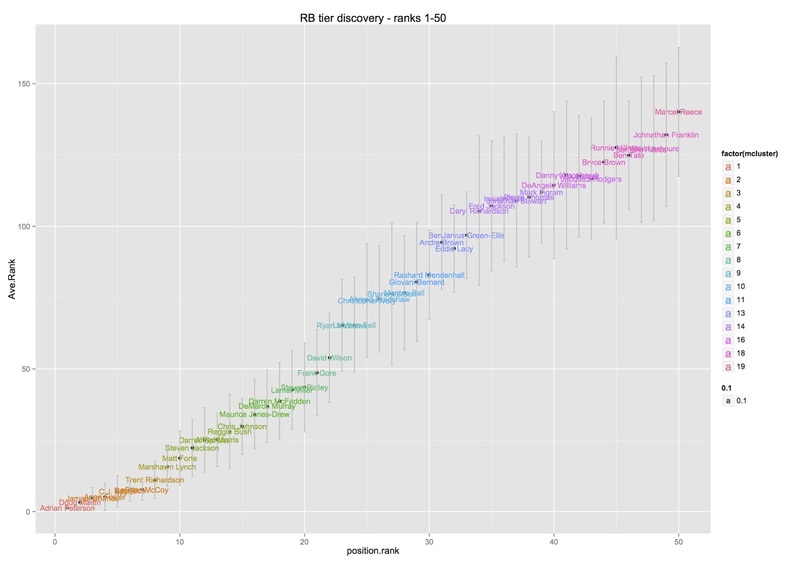 As you can see, in PPR the first 22 RB's are fairly linear, that is, there does not appear to a heavy tier structure as there was in standard format. This changes once we get to RB23 to RB35 territory. The natural tier structure emerges and you can begin to safely tier players together: Mathews/Bell, Ivory/Bradshaw/Vareen/Ball, etc. 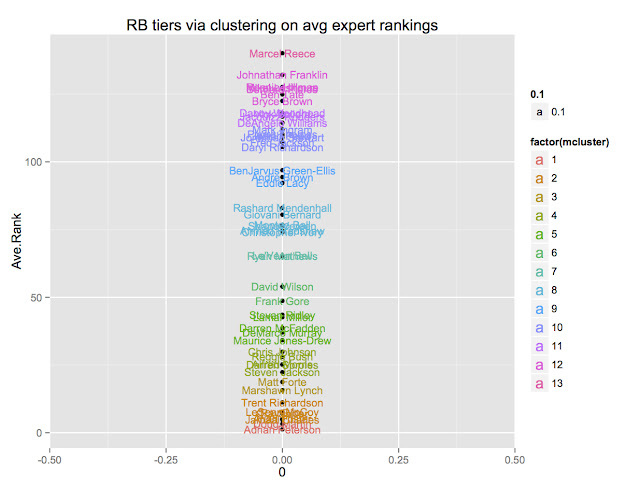 You can see the variance blows up at Daryl Richardson (RB34) and later (translation: disagreement among experts). Therefore, Green-Ellis, who is RB33, is probably the last RB I would fight for. Beyond him I would recommend using your gut feeling or your hunch sleeper. At a glance of the one dimensional vertical plot, things in PPR look similar to standard. You can see how well defined tiers 1, 2, 3, and 4 are (up to Victor Cruz, WR11). This should help solidify your first few rounds of picks. Other drop offs occur after Antonio Brown, Torrey Smith, James Jones, and Tavon Austin/Kendall Wright. 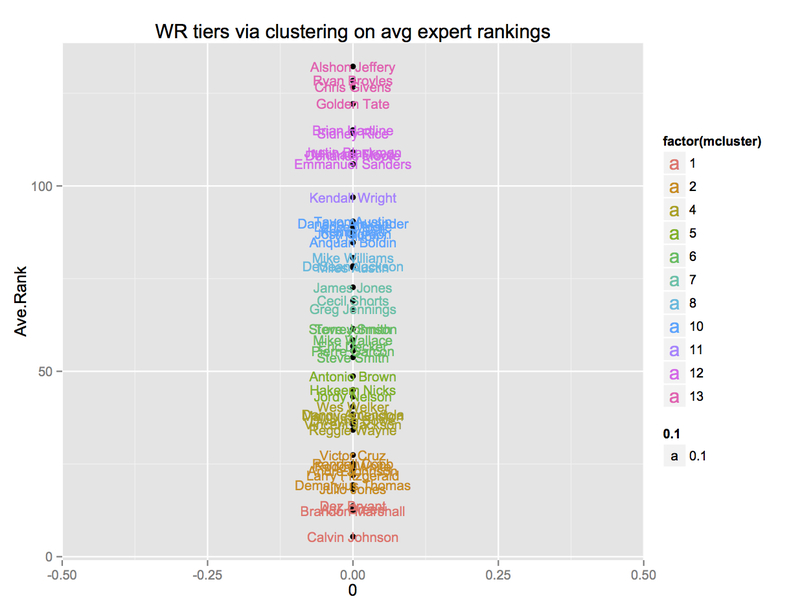 A big change from non-PPR is that Witten leads the tier 2 pack. 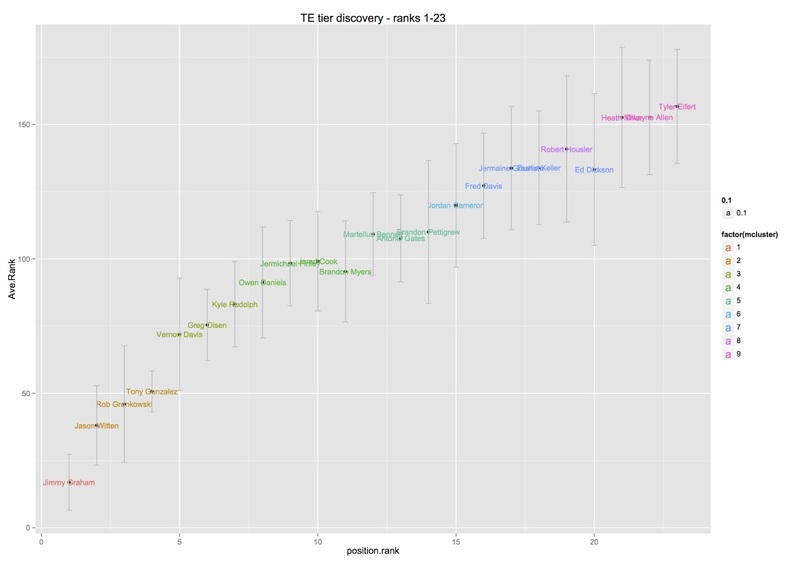 You can also see that tier 3 (Davis/Olsen/Rudolph) and tier 4 (Daniels/Finley/Cook/Myers) are much closer together than they were in standard format. 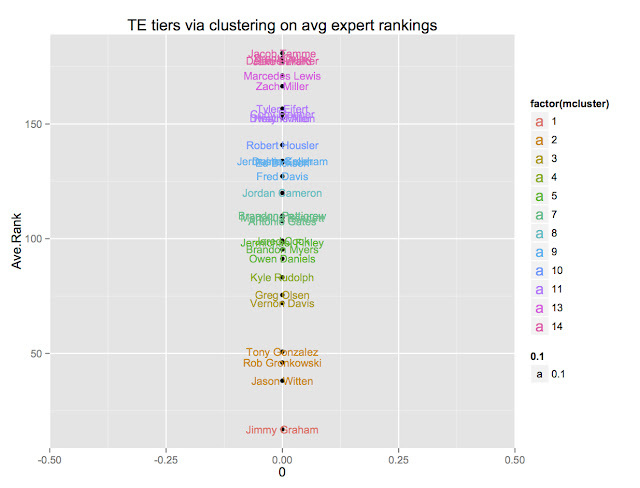 So don't feel too bad if you miss out on a tier 3 TE. That said, if you can grab Gonzalez or better, you probably don't need to draft a back up TE. Good luck drafting! You can follow me on twitter, as I'll post tier lists from week-to-week to offer insight on choosing starters. Also, expect updates as the preseason unfolds.